Avalon, CA – R.D. Olson Construction is announcing the completion of Catherine’s Terrace at Descanso Beach Club, a two-story, 12,683-square-foot oceanfront event venue in Avalon, California. The Irvine, California-based general contractor was selected by owner Santa Catalina Island Company, Catalina Island’s longest-running operator and resort-service provider, to construct the new venue at Catalina Island’s Descanso Beach. R.D. 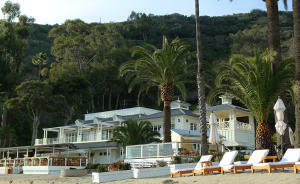 Olson broke ground on Catherine’s Terrace at Descanso Beach Club in November 2013. “This construction project is situated directly north of the iconic Catalina Island Casino, at the island’s famous Descanso Beach and will continue the Santa Catalina Island Company’s mission to build on Avalon’s incredible legacy,” said Bill Wilhelm, president of R.D. Olson Construction. Catherine’s Terrace at Descanso Beach Club is built to accommodate corporate meetings, social events and weddings. Indoor seating within the clubhouse venue’s flexible ballroom space can be arranged for groups of 20 to 200 guests. The clubhouse includes two private banquet facilities and a pre-function foyer, offering more than 7,000 square feet of indoor and outdoor function space. The ballroom is situated on the second floor and has bi-folding glass doors that open onto the 1,970-square-foot canopied terrace to accommodate cocktail receptions and allow guests to enjoy panoramic views of the ocean. The clubhouse’s first level includes a 5,000-square-foot kitchen and service bar for guests at the Descanso Beach Club, and Descanso Fresh, a beachfront café serving coffee, baked goods, ice cream, smoothies and handmade pizza. R.D. Olson Construction worked with the project’s design architect, Backen, Gillam & Kroeger, and architect of record, Melzer Deckert & Ruder Architects, to deliver a venue with a design that fits its Descanso Beach location and complements existing buildings along Avalon’s waterfront, including two additional R.D. Olson Construction projects: Avalon Grille and Pavilion Hotel. Design elements such as hickory wood flooring and a fossilized stone fireplace bring the structure’s ocean-inspired design into the interior of the space.